We LOVE these tricycles and LOVE the idea of having more kids, from a younger age on bikes. Toys like this can help get the family outside, while keeping everyone active and providing kids with a way to play sans carbon emissions. This is a great present for baby showers, grandchildren, or for any parent who wants the hip/unique trike for their kiddo. 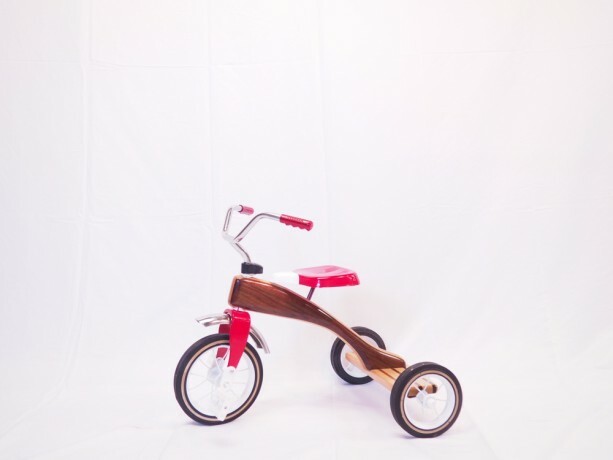 Each tricycle is hand crafted out of beautiful hardwoods into a seamless marriage of natural wood products, built with the age-worn techniques of skilled carpentry and new intelligence of technology. Our bikes are engineered to be functional, safe, and comfortable. We've paid special attention to safety for kids on tricycles, but the design is straightfoward here -- the real challenges came with the full sized bikes. We're excited to see more kids on bikes and more kids on wooden trikes. But, we can assure you, that if you purchase a wooden tricycle from us.. you'll be the most unique trike at the party.